The Department Of Science And Humanities provides basic knowledge to all students before probing deep into the Engineering subjects. I Welcome all the students to the department of Humanities and Science . It’s my pleasure to introduce our department. Humanities and science is the pillar of all engineering educational process, is efficiently supporting the engineering departments by providing the high quality of teaching in basic sciences. Our department attempts at a holistic development of the first year Engineering Students. Our vision is to ignite the inherent application skills of theoretical knowledge. Our Department has got well qualified talented and dedicated faculty members of this department have always endeavored to prove the best in terms of knowledge and skill. We Organized Symposium, Inter department programs and guest lecturers to inspire and motivate the students thus helping them not only in academic but in their all round development. It remains a privilege to the head of the department with highly motivated and dedicated personnel, who are all prepared to go the extra mile. Head, Department of Science and Humanities. Humanities and Sciences Department is headed by Dr. V. S. Mathu Suresh, professor of Mathematics. The disciplines offered by this department are Technical English, Engineering Mathematics, Physics and Chemistry. The Departments is Supporting department to all Engineering branches. It features an effective Curriculum and dedicated activities which can provide the BE students with excellent technical education. Due to the Superior programs such as symposium, SAHAR- a inter department function and the association function , the students earn proficiency in the technical aspects, and they can turn out to be the leaders in the future, by using excellent managerial skills, displaying technical process and proving themselves to be the high productive workers. The students are offered with the basic concepts and technicalities in the engineering Subjects, So that they can understand the advanced aspects of engineering in the further graduation years. They are motivated the care to make them interested in the subjects that they can learn effectively and prosper. The laboratory and classed for improving English communication skills are provided by the department and they enlighten the students with the needed theoretical and practical sessions. Our upcoming graduates are also provided with regular counseling, to help them solve the issues related to education and career building, and promote all round improvement in them. English language proficiency is the wing to the technocrats to rear in the globalized ere and we provide it English Department of RCET is enriched with experienced staff members. Apart from the syllabus oriented teaching, special care is given in developing the communication skills of the students thereby enable them to face interviews in future. There is a well equipped language lab with language software for the development of the students. Students are identified and trained at different levels so as to develop their language, covering all the four skills Listening, Speaking, Reading and Writing. Special communication hour is inbuilt in the time table staff provides motivation and confidence to the students and also evades and latent fear in them. Essays and elocution competitions and various other cultural activities are conducted in English to develop the talent of the students. Opportunities are provided individually to every student to be on stage with some topic in English thereby to develop by their courage and confidence Communication and interactions are made compulsory in English inside the class room. Apart from these English department faculties have published the book. Technical I and Technical English II on the basis of the syllabus prescribed by the Anna University for 2013 regulation. Chemistry department of RCET consists well experienced and qualified faculty members. Apart from syllabus, more importance is given in imparting basic concepts of Chemistry, which will cater to the need in the Engineering field. 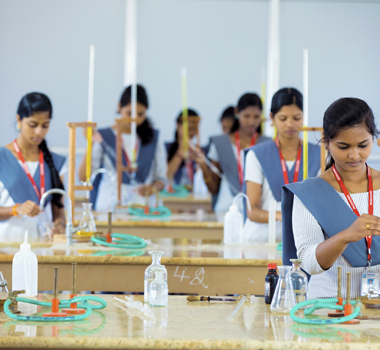 Well equipped spacious laboratory facility is the outstanding feature of the Chemistry department of our College. Lab consists of all chemicals, instruments and apparatus in more than sufficient quantity for the effective utilization and development of the students. Spectrophotometer, Conductivity meter, PH meter, potentiometer etc and all related electrodes are some of the remarkable instrument. Facilities in the lab another outstanding are that the water used for lab purpose is completely purified by an exchanger. Gas connection is provided at each table. Modern table with fixed granite and individual wash facilities is provided. Separate locked rack for storing the chemicals is also an added advantage. The Mathematic Department of RCET is an interdisciplinary departmental centre for education and helps all the other departments as Mathematics plays a very important role in all the branches of engineering. Department of Mathematics provides basic foundation to engineering students, through highly qualified professors. The Department handles Mathematics-I, II, Transforms and Partial Differential Equation, Probability and Random Process, Probability and Queuing theory, Statistics and Numerical Methods for B.E and Applied Mathematics for Electronic Engineers and Operations Research for PG Students. 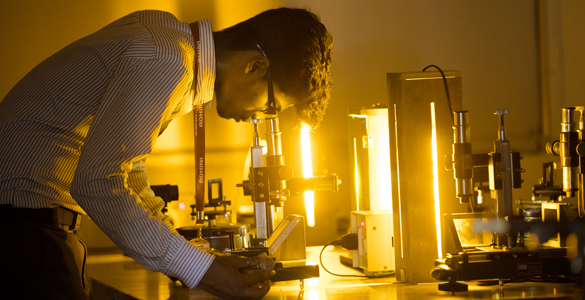 The physics department of RCET has experienced and talented faculty members whose expertise is always exposed to all the students. Our motto is to bring up interest and enthusiasm in learning and to nurture and nourish younger minds and thereby infusing confidence and competence to boost their technological caliber. An easy access full-fledged modern laboratory with ultra modern infrastructure is made available to all. Students are motivated by proper and timely guidance and counseling are encouraged and inspired by innovative teaching methods. A separate Dark room is also provided as per the requirement of the university syllabus.